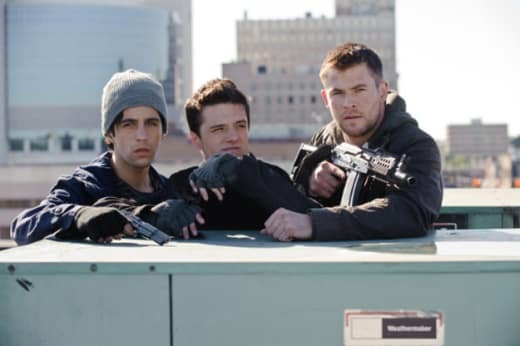 Red Dawn stars Hemsworth, along with Josh Hutcherson (The Hunger Games), Josh Peck, and Adrianne Palicki. It follows an American city that finds itself under attack by foreign paratroopers. Determined to defeat them, a group of teenagers start a guerilla army to liberate the town. The film is a remake of the 1984 film starring Patrick Swayze, Lea Thomspon, and Charlie Sheen, who will play the President in the upcoming Machete Kills. You can see Red Dawn in theaters beginning November 21.